As an English teacher, I always gravitate towards a strong introduction. Amidst the dreck, there are those essays that begin with a statement of purpose that gets your full attention while setting the stage for the story to come. Since I am also a music junkie, there is something compelling about the rare album that grabs you by the wazoo and informs you that this artist means business. It seems like an easier task if you traffic in the genres of punk or metal as you can blaze through the opening minutes, but a prog-pop album with Tropicalia influences has a much higher handicap in the first at-bat. 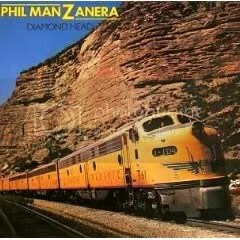 Diamond Head was Phil Manzanera’s debut and it is kind of surprising when you consider that he made his name as the guitarist for Roxy Music. It is less surprising when you dig deeper to find that he contrinuted to Brian Eno’s solo albums as well as leading 60s psych outfit Quiet Sun. Even when you take this all into consideration, his debut is a surprising twist in a successful career. “Frontera” is the opener is question and it derives most of its strength from Robert Wyatt’s tour de force of Spanish gibberish accompanied from a driving riff that hits the high notes one always desires from a debut, but rarely receives. To be honest. the rest is a slight letdown from the heights of the first few minutes, but the lazy prog riffs are pretty excellent and much of the album is predictably reminiscent of Eno’s first vocal albums. Other moments remind me of a more sleazy soundtrack to Boogie Nights, but that is ok with me too. It is a scattershot affair, but Diamond Head finds its way onto the stereo because of its schizophrenic nature. It kind of wants to be loved, but Manzanera dips his toes into all sorts of 70s sleaze that it is rendered somewhat pock-marked and damaged. It is supposed to be accessible, but there is something awkward about it that draws me to it. The opener is worth the price of admission since it may be one of my my favorite Robert Wyatt tracks, but the remainder is interesting to say the least. Diamind head is a big old frog that only got a reacharound instead of a kiss.